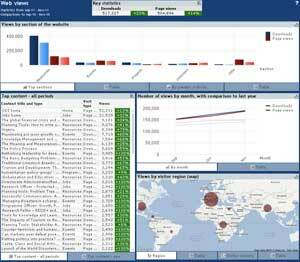 This post has an excellent description about how one think tank, the Overseas Development Institute, constructed a dashboard to better monitor and evaluate how it’s outputs were being shared through its main communication channels. Reading it got me thinking about what an equivalent campaign dashboard would look like. I’m not aware of any campaigning organisation that uses such a dashboard, so I’ve put together my ‘wish list’. I’ll leave it to the IT experts to let me know what’s possible. 1 – Actions Taken – Most campaigning organisations have a bar which indicates the number of actions that have been taken, often in the context of a target that’s been set, but I’d want to the tool to go a step further and tell me about the trends. How many actions have been taken in the last hour or day and how this compares to other actions and trends across the sector. If I was focusing my campaigning on MPs I’d like to have some indication of the number of MPs my campaign had reached. 2 – Social Media – I’d want to know figures about how my campaign was being talked about on Twitter, statistics about Facebook interactions, number of views of relevant YouTube clips, etc. 3 – What people are saying – Pulling in relevant hashtags from twitter, plus blog and media mentions using Google Alerts, along with mentions in Parliament (if relevant) using TheWorkForYou. If possible, I’d try to draw this into a ‘favorability’ rating to indicate if people were positive about the campaign. 4 – What supporters are saying – Depending on if it would work organisationally I’d want to have a stream that was telling me about what our supporters were saying about the campaign through their interaction with our supporter enquiries team. Perhaps in a Wordle like that used by the DCMS in their reporting to Ministers. 5 – Open Rates for emails – Drawing in the information on the latest e-actions that I’ve sent out. Using dashboard information like that presented in MailChimp. In addition, I’d like the dashboard to be able to record, when appropriate, the number of supporters who’d signed up to come along to a mass-lobby or demonstration that I was organising, but recognise that ‘s harder to capture in a dashboard. Does anyone know of an organisation using a dashboard like this? Would it be possible to develop something like this?